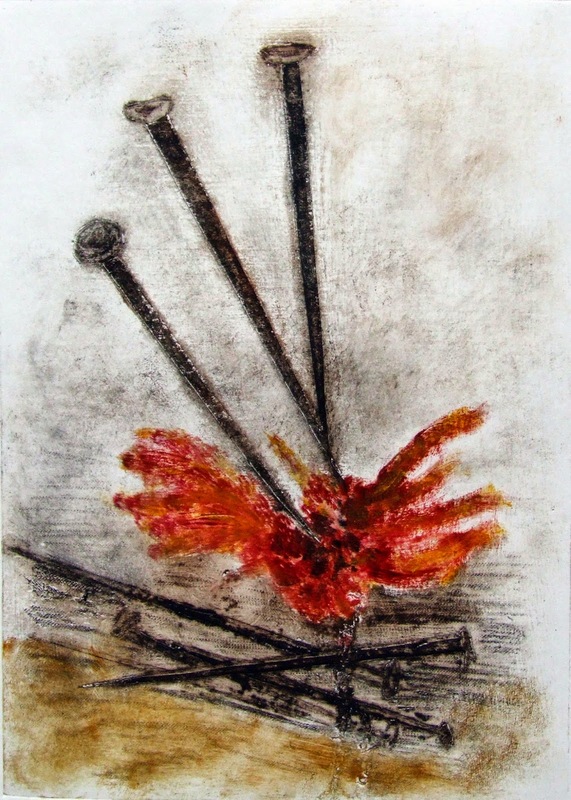 My image ‘Strength’, from an original collagraph print, has been chosen for the cover of a new book of poetry entitled The Nailmakers' Daughters which is to be published in September 2015 by Offa’s Press http://www.offaspress.co.uk The book will be launched during the evening of 8 September at 'City Voices' poetry evening in Wolverhampton at the Lych Gate Tavern. Hold the date for the private view of the new exhibition, ‘Changing the Laws of England’, an exhibition of volumes of altered book art. It opens on the 800th anniversary of the signing of the Magna Carta - 15 June - at the Sidney Nolan Trust’s Tithe Barn Gallery from 6.30-8.00pm. Paintings by the acclaimed Australian painter, Sidney Nolan, will also be on show. I’m currently waiting for the (fake) blood to dry on my volume of Halsbury Statutes – ‘War and Emergency’ – but it will be ready and in place in the Trust’s lovely gallery at The Rodd, just outside Presteigne for the opening.